From Mouse Review, Issue No. 17 (March 1990) unless otherwise noted. Permission given to reprint article. Originally printed in the RMHF Newsletter, Vol. 5, No. 6, 1989. Virginia revised this somewhat for Mouse Review. Animal was entered in the wrong class. Animal was sick, defective, or in poor condition. Animal was such a poor specimen of its variety that it could not compete. The animals which were eliminated for any of the above reasons did not even get a score sheet filled out by the judge, and beginning fanciers NEED score sheets in order to learn what is good and what is bad about their animals. Therefore, these are suggestions for choosing, preparing, and classifying your show stock before the show. 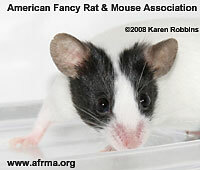 Mice are at their best for showing between 6 and 14 weeks old. Since we do not have separate classes for mice under 8 weeks of age, as they have in England, we must bear in mind that a very small youngster will be at a disadvantage when judged against a mature individual*. Also, mice over 14 weeks or so may lose condition and not stack up against young adults in their prime. Some varieties (such as Agouti) tend to hold their good show condition much longer than other varieties. Also, consider that does which have not yet borne litters are apt to fit the standard better than will does with baggy sides from carrying and nursing young. The standard calls for “. . . body to be long and slim, a trifle arched over the loin and racy in appearance.”** A good doe will beat a good buck in this regard, since stud bucks tend to become massive when adults and lose that racy look. Levelness of color. The standard for Selfs states that the color must be EVEN all over the mouse from tip of nose to tail set-on, and including the ears, toenails, tail, and belly, and must extend down to the skin. Condition. The coat must lie smooth and flat against the skin and should have a glossy shine. The eyes must be wide open, bright, and clear. There must be no sores or scabs on the skin, and breathing must be normal. The mouse should be neither fat nor thin. Condition is the very first thing the judge notices when looking at your animal and it is absolutely no use entering an animal which has a coat standing up all over, or looks as if it has been chewed on, or has a runny eye, etc. Any fancier can judge the condition of his animals. An animal in good condition looks good, feels good, and should appear to be bursting with good health and vigor. Check that all TOES are whole, WHISKERS are all present, EARS are not nicked or split, TAILS are not kinked, etc., etc., etc. Any such flaws will not be able to compete in a show. Whisker biting can be a serious problem with some stock. Temperament is very important. If your animal is trying to bite you or jump off your hand, leave it at home, since the judge will not bother with it. An animal will have to be tractable in order to be judged properly. Frequent gentle handling will help to quiet down your animals before a show, but temperament is basically inherited in mice. Remember, when choosing your breeding stock, that if you use wild mice for breeders, you will get more wild ones in the next generation of that strain. Now you have chosen your animals for the show, several days in advance, and can prepare them to be shown. Attention must be paid to cage cleanliness. If the animal is in any way dirty, wet, or stained, you may be sure the judge will see it. Food before the show can include a small amount of oily seeds such as sunflower, linseed, or budgie mix. These will put a shine on the coat if the animal is already in good condition. Don’t overdo this. You don’t want the coat to get greasy, just produce a good sheen. This is a good time to prepare your show cages. Make sure you have enough of the acceptable type of cages for the show bench, that they are CLEAN inside and out, and that you have sufficient clean bedding in each one. Be sure to use enough shavings so that the animal feels comfortable and secure. A mouse in a bare cage is very frightened, and within a few minutes will appear to be in poor condition as it huddles miserably in a corner of the cage with its eyes squinted and coat standing up against the cold. Not much there for a judge to be impressed with! After you get to the show, and before your class is called to the bench, you may groom your mouse with a silk cloth or a shaving brush if you like, to remove any stray specks of dust. Animals may not be groomed or touched after the cage is set on the judging bench. Do not talk to the judge during the judging, nor make any remark within the judge’s hearing which indicates which animal is yours. This is considered very bad form at any sort of animal show. The judge will be happy to answer any questions for you after the judging is over. If your animal has been eliminated from competition after the breed class, you may ask questions before the next class begins. If your animal has won first place in your breed class and is still in competition for Best In Show, you must not indicate which animal is yours. It is surprising how many exhibitors are insensitive to this when they are beginners. On arrival at the show, you must register with the Show Secretary, pay your entry fees, and be sure your animal is entered in the correct class. If you have any doubt at all which class it belongs in, ask the show secretary to find you a mouse expert to help you classify it. Someone will be available for this. We hope this will prevent animals being disqualified for minor infractions in classification, and prevent so many fanciers from being disgruntled over not getting a score sheet filled out. Let us put ourselves in the judge’s shoes, coming across a large class of good mice with many fit to take a premier award. It often happens. A judge must then make up his mind as to which is the best mouse, and a split point may decide. Isn’t it therefore to be expected that judges will vary as to what constitutes the split point? I have always said that exhibitors should have a “packet” as a judge to realize the difficulties and be more tolerant. Tolerance is one of the main virtues in life. It signifies a true sportsman. When, therefore, you are out of luck, don’t blame the judge; blame yourself and see where you have gone wrong. If you are at the show, ask the judge for his opinion. It is unfortunately true that in some varieties, judges have their individual likes and dislikes regarding shade. Find out what this is and send a mouse to suit. But of all things, don’t penalize the next show because of the judge. Finally, breed mice of quality and let them stand out above the others, when you will get clear of the “split point” verdict and most assuredly take the red card under any judge. Ed. Note by Karen Robbins: Red cards in the N.M.C. are first place wins. “1. Get a good steward. Get comfortable, sit at the right height at the table. Put the mouse on your hand facing you and still hold on to its tail. Whiskers . . . All there? Eyes . . . Good or bad? Ears . . . Good or bad? Width between ears . . . Good or bad? Colour . . . On top, good or bad? Patchy, moulty, shiny?? Colour . . . Under, same as top? (Except Tans). Thick, solid colour? Tail set . . . Good or bad? Tail long and free from wrinkles. Tip essential. Feet . . . Same colour as top. Good or bad? Type . . . The overall look of the mouse when turned in your hand, left side, right side. Condition . . . Is the mouse fit and clean? Thank you, Don. This is good for all of us to know, even for selecting the best mice in our own mouseries. A Black Dutch female owned by Kelli Boka, bred by Phil Brookes, England.